In this poster, a tool named BUCEFALO is presented. 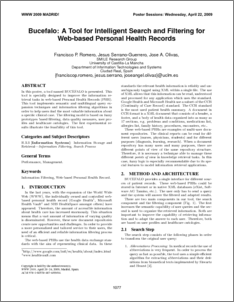 This tool is specially designed to improve the information retrieval tasks in web-based Personal Health Records (PHR). This tool implements semantic and multilingual query expansion techniques and information ﬁltering algorithms in order to help users ﬁnd the most valuable information about a speciﬁc clinical case. The ﬁltering model is based on fuzzy prototypes based ﬁltering, data quality measures, user proﬁles and healthcare ontologies. The ﬁrst experimental results illustrate the feasibility of this tool. standards the relevant health information is reliably and unambiguously tagged using XML within a single ﬁle. The use of XML allows that this information can be read, understood and processed for any application which uses the standard. Google Health and Microsoft Health use a subset of the CCR (Continuity of Care Record) standard. The CCR standard is the most used patient health summary. A document in CCR format is a XML document that consists of a header, a footer, and a body of health data organized into as many as 17 sections, e.g. problems and conditions, medications list, allergies list, family history, procedures, encounters, etc.. These web-based PHRs are examples of multi-user document repositories. The clinical reports can be read for different users (nurses, physicians, students) and for different purposes (diagnosis, learning, research). When a document repository has many users and many purposes, there are different points of view of the same repository structure. Therefore, it is necessary a technique able to manage these different points of view in knowledge retrieval tasks. In this case, fuzzy logic is especially recommendable due to its special features to model information retrieval applications.